Great American Garden Survives Santa Barbara Fires : Talking Plants Blog When the Santa Barbara fire began last week in the community of Montecito, I thought of two people: T.C.Boyle and Ganna Walska. When the Santa Barbara fire began last week in the community of Montecito, I thought of two people: T.C.Boyle and Ganna Walska. I haven't contacted the author to see if his Wright-designed home suffered damage-- if it has, the last thing he needs is unsolicited e-mail -- but I do know he's spent the last decade not only churning out literature but pulling out weeds and establishing natives in his meandering woodland garden. Eight years and a few lifetimes ago, I spent some seriously eye-opening time with Boyle. Step right up for a private radio tour of his place as heard on Morning Edition. The Montecito garden I was really worried about is nothing less than my favorite private garden in the country, Lotusland, once the home and still the work of the flamboyant Ganna Walska, a woman whose greatest creation was undoubtedly her very self. I'm delighted and relieved to report that Lotusland was untouched by the fire. Lotusland doesn't actually get its name from the plant but from an evocative piece of music Madam Walska was particularly fond of written by the English composer, Cyril Scott (WRONG! See correction at end of story). You gotta hear it. Here it is as originally intended for piano (can anyone figure out who's performing?) and again as played by the great Fritz Kreisler who transcribed it for violin and piano. Shoot me but I like it best for solo piano. With all due modesty, I'd be delighted if you'd give a listen to this story about Ganna Walska. Not only was she quite a character, but her dramatic flair and idiosyncratic tastes have resulted in one of the most magical gardens I expect I'll ever know. 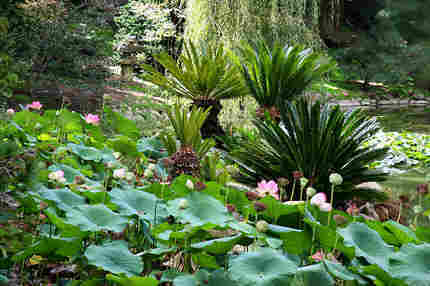 Lotusland, one women's botanical fantasy, may be the most exotic public garden in the country. There's a chance you might even get to see it, should you make a reservation a year or two in advance. 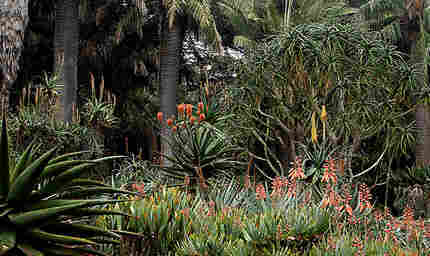 The place will leave you breathless--writhing aloes, ferns like fountains, valleys of prehistoric plants. Lotusland's Virginia Hayes likes to linger in the garden that gives the place its name.